If you’re employer is offering you a severance package the employer will most likely ask you to sign a severance agreement which you should not sign before seeking the advice of the Law office of Kenneth Carp. Almost all agreements recited that you had the opportunity to have a lawyer review the agreement. Employers do this to close the opportunity for you to come back and argue for more. Our experienced attorneys will explain the severance agreement to you and when possible negotiate for additional pay, cobra, or other benefits. Attorney Kenneth Carp has more than 20 years of experiences and will explain the legal consequences of a severance agreement to you. If you lost your job, you are probably worried about a number of things. How will I pay my bills? Will I have health coverage? What about my retirement or 401(k) plans? You may decide to file for unemployment benefits. However, benefits are not guaranteed just because you file for them. Therefore, before you file, you should consult with an experienced employment law attorney. 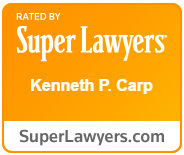 At the law office of Law Office of Kenneth P. Carp, we will help you understand your rights when losing a job. We assist people across the United States correctly file for the benefits they need. We also advocate for those whose claims have been denied, and guide them throughout the entire appeal process. If you need unemployment benefits, you may think you have to wait until you use up your severance pay before you are eligible to file. However, unemployment benefits are not based on need, so you don’t have to wait until you exhaust all your funds in order to file. Our lawyers will help through the application process so that you don’t have to use all your savings to stay afloat. We want to help you keep your life on track. By working together, we will educate you and advocate for you so you can get the financial security you need. If you’ve lost your job, the law firm of Law Office of Kenneth P. Carp is here to protect your rights and preserve your peace of mind. Contact us online or by calling 636-947-3600 to schedule an appointment.